I know, I know, it's a time honored tradition. Has remained unchanged through the decades, despite major advances in photographic technology. I hate them. I hate them. AJ looks completely bewildered and uncomfortable. AJ's look says "this is not what we usually do at this time, and I'm unhappy about the change. Can we just go back to the classroom now please?" 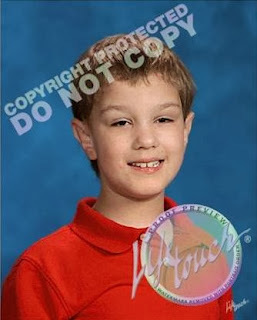 Zack's picture is somewhat cute, but it still doesn't show his real, true smile. This look says "I'm as tense as I get. I'm going along with this for now but I'm probably going to freak out later." Why must every single flaw and imperfection be magnified x100 in a school picture? I don't understand it. Look at that slept on, awkwardly trimmed hair. 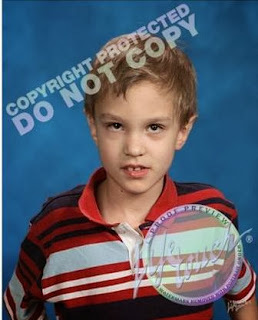 Why can't the photographer visit the autism classroom and capture the kids there? They still won't like the intrusion, but at least they'll be somewhat in a familiar element and he's more inclined to get a true expression. I know what you're going to say. They are precious in their own way. That these are great pictures that show where they are at, at this particular point in time, and that some day I'll look back on all the school pictures with nostalgic fondness and I'll think they are all beautiful.